The Bacharach MVR-300™ is a new refrigerant detector for occupied spaces to enhance safety, legislation compliance and HVAC efficiency. 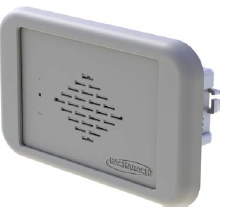 It has a flush mount design that fits into a 2-gang electrical back box, and is mains powered. It has audio-visual alarm alerts and programmable high and low level alarm relays, plus a programmable Modbus interface allowing integration into a building management system. The MVR-300™ from Bacharach, automatically detects mechanical and software faults using its own self-diagnostics with LED indication of status critical and non-critical faults plus fault code and status output via Modbus (if used). The plug-in field replaceable pre-calibrated sensor and simple automated gas calibration routine make the MVR-300™ easy to maintain and calibrate. Available from Climalife, the MVR-300™ is an ideal solution for refrigerant gas detection in hotel rooms, hospitals, offices or any other occupied spaces where high refrigerant volume HVAC systems are installed. Versions are available for detecting R32, R407C, R410A and R404A. Contact Climalife for more information.